Tonight was my first time along at the London Arduino Meet Up. control of his little light) where he showed two methods of flicking the switch. arduino and hey-presto it worked. The second method that he demonstrated was a little more complicated involving node.JS, sockets and other technical jargon that I didn’t catch. On a similar vein we had Liam demonstrating the use of a TP-Link Wireless N Nano Router (TL-WR702N) to connect an arduino to the internet. He argued that the use of WiFi shields is overly complicated compared to Ethernet shields, as well as being a lot more expensive So if you are willing to have a slightly bigger package then you can connect the Ethernet shield to the nano router and leave that to sort out the complicated subtleties of wireless connections, allowing you to get on with innovating your wireless solution. Another thought is that a nano router is much more versatile than a WiFi shield because it can be plugged into a computer, games console, Raspberry Pi, or any other device that has an Ethernet socket. In the realm of Hobby Electronics we had Danny, who was plugging his first ever kit robot. Orionrobots.co.uk is his creation and is where he is selling his first his own starter kit robot. In this kit you will find everything that you need to to construct a small chassis with 4 wheels controlled in pairs (left and right) by a L298n dual H-Bridge controller board which is interfaced to an Arduino Uno R3 (provided in the kit). With a easy fit design, you only need a screwdriver to put this kit together making it perfect for anyone who is; unsure with tools, in need for a robot chassis quickly, or just lazy. The final talk of the evening was from Mark, on behalf of another London Tech Meet-up group, Future Manufacturing, who have a keen interest in 3D printing. They are really keen to see cross collaboration between our two groups on various projects including potentially the Luma Module Interactive Spaceship. 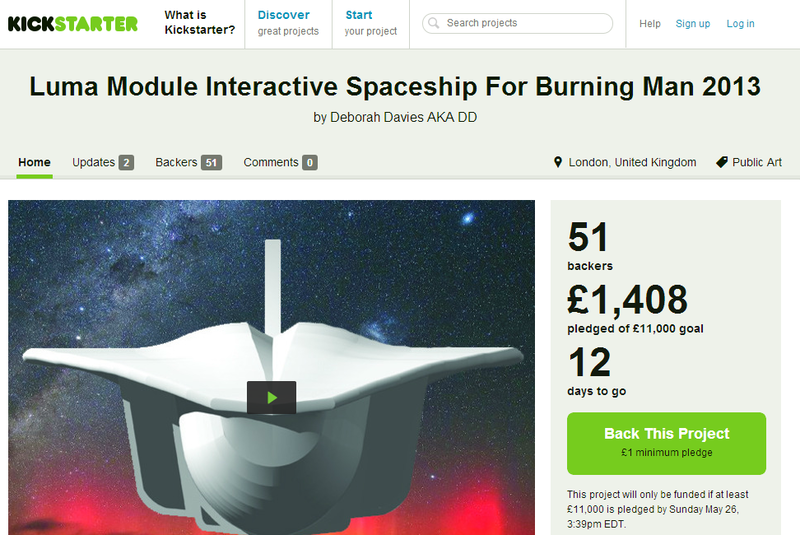 The Luma Module is a KickStarter project where they want to build a spaceship that lights up when people interacts with it. This spaceship will then be shipped (no it won’t fly itself) to Nevada for the Burning Man art Festival at the end of August 2013.